The Civil Rights movement is an important part of African American history. 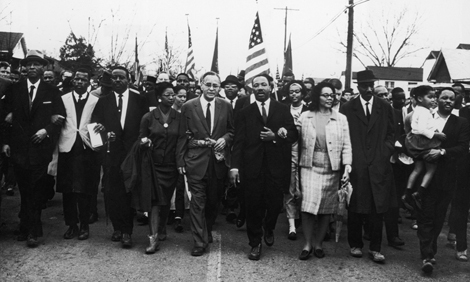 This photo shows Dr. Martin Luther King, Jr., leading a civil rights march from Selma to Montgomery, Alabama, in March 1965. Since 1976, February has been celebrated as Black History Month in the United States. One important person you might hear about during Black History Month is Dr. Carter G. Woodson. Dr. Woodson is often called the Father of African American History. Carter G. Woodson was born in Virginia in 1875. As a young man, he worked in a coal mine. Because he had to work long hours, he was unable to attend high school until he was 20 years old. After high school, he studied at the University of Chicago. He later earned his doctorate degree at Harvard University. He was the second African American to earn a degree from Harvard. After finishing his studies at Harvard, Woodson founded the group that is known today as the Association for the Study of African American Life and History (ASALH). The ASALH is dedicated to researching African American culture and history. Woodson also wrote college textbooks about African American history. In 1926, Woodson started the idea of having a special week each year to honor African American history. He chose the second week of February because President Abraham Lincoln’s birthday and abolitionist Frederick Douglass’s birthday are both in that week. Some people organized clubs that studied African American history. Some schools and communities held celebrations. In 1976, the weeklong tradition was expanded to a month-long celebration. It officially became known as Black History Month. Since then, every United States President has named February as Black History Month. Black History Month is an opportunity for Americans to learn more about contributions that African Americans have made to United States history. Who is often called the Father of African American history? Whose birthdays are in the second week of February? Dr. Carter G. Woodson and Dr. Martin Luther King, Jr. When did February officially become Black History Month?